OK, so I’ll admit it, I snore a little, as I found out recently. Not quite the Surround Sound kind that rattles the walls and has your neighbors calling 911 but more like the heavy breathing prank call from “When a Stranger Calls”. Either way, I think snoring is sheer terror unless of course it's Robert Pattinson who's doing the snoring. Ahhh Twilight. There are about 80 million people in America who suffer at the hands of snoring, which means, when you factor in their partners, 160 million people needlessly put up with waking irritability, a weakened immune system and sluggish reflexes. Hello Silent Snooz. Designed to ease, if not eliminate, the immediate and peripheral discomfort of snoring. Silent Snooz is a small v-shaped nasal dilator that fits comfortably onto the base of your nose. It’s about the size of a small earring. The dilator is designed to exert sufficient, gentle, “barely there” pressure to effectively open the nasal passages, helping to ease snoring. 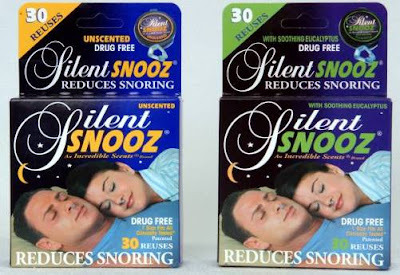 I’ve been using Silent Snooz for two weeks now and all reports say that my snoring is remarkably diminished. I like what I hear. Are You More Salt Than Pepper? Shave Creams: Where Does Yours Rank? Oh Bruno, How Clean-Shaven Should We Go?